Almost as versatile as the Simple Kilt, the Mystic Sarong is a great piece of leg-armor to own. It’s unique design will flatter just about any race (some skin colors might not work too well with the color-scheme of the sarong), and it is perfect for “elegantly casual”, everyday wear. 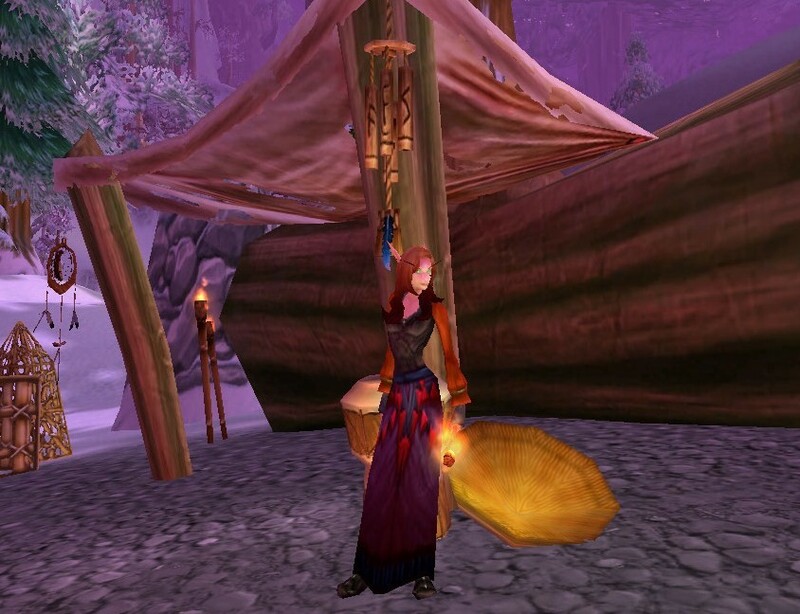 The Mystic Sarong is sold in a limited supply by several vendors, and, as you may have read in the Darkmoon Faire article, I purchased mine from a tradeswoman out in Hillsbrad Foothills. Although I haven’t seen too many people wearing it in Lightninghoof…the vendors always seem to be sold out, LoL. The Interlaced Vest touches the dustier reds in the sarong’s design. It’s a gray world-drop, but, this vest’s style can be found in different colors in other cloth chest armor (colors that may or may not match the sarong). 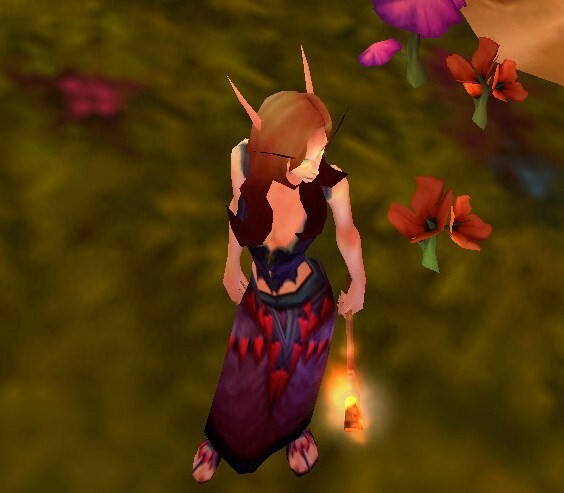 Grayson’s Torch was a reward from a quest out in Westfall, one that is obtainable by both Horde and Alliance players. This next outfit uses the Tribal Vest along with the sarong. The Tribal Vest has a blackish-purple lining the ties the red of the chest piece into the darker shades of the sarong (well, the red matches too ^_^ ). This same style of chest piece is repeated in other leather and cloth armor; however, make sure the colors match up. The Black Swashbuckler’s Shirt doesn’t really look black too me…it appears to be more of a dusty blue/gray, which is fine, because there is a dark blue waist-band on the sarong that it matches perfectly, not to mention, the lighter shades of the shirt echo some of the lighter shades in the sarong’s pattern. 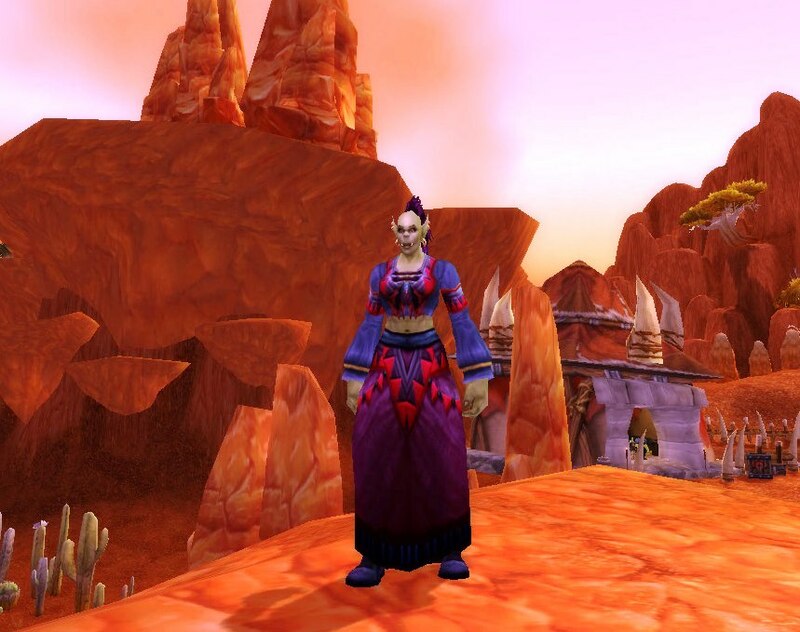 As seen in the Darkmoon Faire article, the Red Swashbuckler’s Shirt will also go great with the Mystic Sarong. 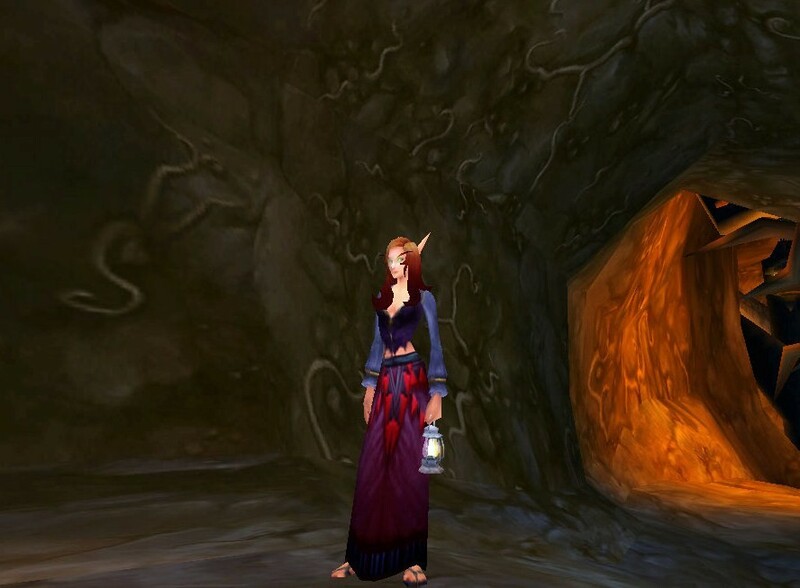 In that same article, Kirina wore another leather chest-piece, the Darkmoon Vest, along with this sarong. Below is the same outfit, only with the Black Swashbuckler’s Shirt worn underneath. The Rough Leather Vest is a darker plum-black color that goes great with the darker accents of the sarong. The Red Swashbuckler’s Shirt brings out the red design, and the dark blue Knitted Gloves echoes the color of the waistline, on the sarong. Looking for the perfect foot-gear to wear with the Mystic Sarong? I find the Sandals of the Insurgent match beautifully in both design style and color. A Mystic Sarong outfit with the Sandals of the Insurgent. It took me a while to finally get a hold of a pair of these sandals, and, I’m sure they’ll be hard for anyone else to come by as well – being that they are a rare world drop of old Azeroth. However, like anything else worth waiting for, you’ll keep them forever ^_^. This post-Shattering addition provides low level characters the look of a Mystic Sarong outfit, without needing the required higher level. The Troll warlock’s Acolyte’s Robe with other accessories. However, these pieces are rather hard to come by. The Magiskull Cuffs are a rare drops from different level 50-60 elites around Azeroth, its highest drop rate is from Nefarian (6% drop). The Lesser Belt of the Spire is even trickier to get than the bracers. Pre-Shattering, it dropped off the Blackrock Shadowcasters in the Redridge Mountains. Post-Shattering, they still drop of the same mobs, but, the whole area that they are at is part of a phased quest line for Alliance characters. If you are a Horde character, you can not farm the mobs. Period. Alliance characters who complete the quest line will also not be able to go back and farm the mobs, as they are phased out after completing Showdown at Stonewatch. The only chance to farm for this belt is while on that quest, but, you have helper NPCs running around with you, and its a low drop rate…if it is even still on the NPCs loot table (WoWhead says that it is not out of the game, but, it is not on the list of what the Shadowcasters drop). Luckily it is not BOP, so, if it is still attainable, Alliance characters who do not complete that quest line can sale it on the auction house. I am sure there are several other leather and cloth chest-pieces, as well as plate and mail chest-pieces, that would work perfectly with the Mystic Sarong – I just used what Kirina had already (I’m running out of bag space to hold any new stuff ^_^).